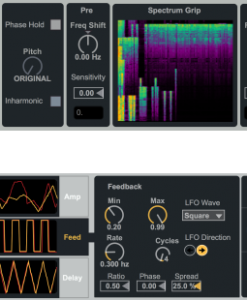 Creative Extensions, a collaborative effort between Ableton and Amazing Noises, comprises eight tools designed to enhance and expand the punch, color and texture achievable with Live. This collection includes new ways to pitch shift and sequence melodies and delays, creative and characterful studio processing, a device that creates ethereal, reverb-like spaces, and two revamped Max for Live synths. Melodic Steps is a fast and intuitive MIDI sequencer that creates evolving melodies with just a few clicks of the mouse. 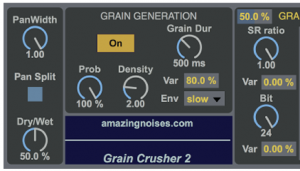 Use it to create quick melodic variation, polyrhythmic melodies or simply randomize your results. Its interface is designed for play, encouraging experimentation and new discoveries. Pitch Hack is a one-stop device for various pitch-related effects. At its heart, Pitch Hack is a single delay line with transposition control in both semitones and cents. Besides pitching the incoming signal in real time, Pitch Hack can reverse the audio, randomize the transposition interval and fold the delayed signal back into the delay line. Gated Delay creates sequenced delay effects. A gate sequencer sends the incoming signal to a delay line on activated steps. This is like a send effect that is turned on and off in a defined rhythm in sync to the music. Controls allow you to adjust the length and rate of the steps, as well as whether the dry signal is audible on deactivated steps, the ratio of the delay rate to the step rate, step randomization, feedback and more. 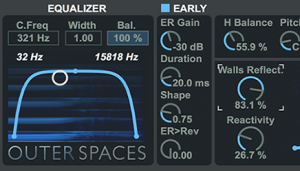 Color Limiter offers another flavor of limiting inspired by the gritty sounds achievable with hardware limiters. Controls are provided for input level (Loudness), threshold (Ceiling), Lookahead, Release and the all-important Saturation and Color parameters that are the key to its characterful sound. Re-Enveloper is a multiband envelope processor. The input signal is first divided into three adjustable frequency bands. 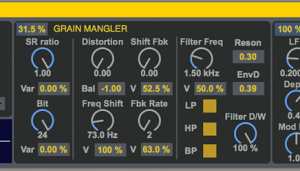 Unlike with compressors, it is the envelope of the signal can be compressed or expanded. The C/E (Compression / Expansion) Factor knob provides detailed dynamics control. With positive values, the envelope is compressed. With negative values, the envelope is expanded. 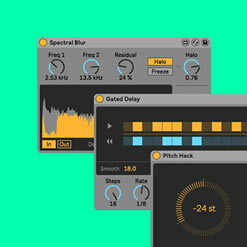 Spectral Blur creates sounds and textures that are best described as reverb-like. A user-defined frequency range of a signal is blurred to create a dense cloud of sound. This device is great for sharp filtered effects with narrow bandwidths, or to spread your sound across the whole spectrum. The Halo control adjusts the length of the blurred grains. The Residual control adjusts the level of the unprocessed signal. Lastly, The Freeze button holds the affected signal until the button is switched off. A monophonic virtual analog synthesizer that provides the entire palette of bass sounds in one device – from classically deep and clean to heavily distorted, rumbling tones. 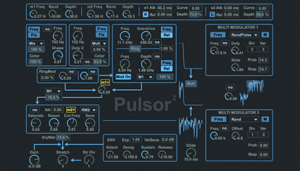 A virtual analog synth designed for playing classic polyphonic chords and phrases. Its vintage character comes from de-tunable oscillators, a powerful modulation section and a built-in chorus.